Left to right: (a) The church from the busy road — still a striking presence. (b) Exterior of the apse. (c) The towers of the church and the Cardiff Royal Infirmary in close proximity. Notice the "Sold" sign: the tower was sold for conversion to residential use. 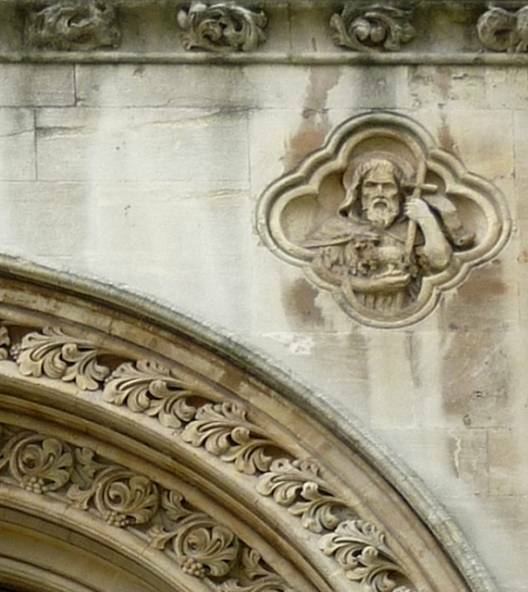 (d) Carving of St John the Baptist , in tribute to St James's mother church in Cardiff, over the tower entrance. Col. E. M. Bruce Vaughan was Cardiff born and bred, and is known mainly in Wales where he had a busy practice and designed not only churches (such as Christ Church, Llanelli; St Gwynog, Llangennech; and St Alban, Aberystwyth) but also Llanelli and Aberystwyth Hospitals, the Board School in Grangetown, Cardiff, an Italian Renaissance-style shop front in Cardiff High Street which attracted much attention at the time, and so on. Some of his work has since been demolished but he still has many entries in the Buildings of Wales series (e.g. see Newman, and Lloyd et al. ; see also "Town Improvements in Cardiff" about the shop front). He joined the 2nd Battalion of the Glamorganshire Home Guard, rising to Colonel. In 1891 he was elected a fellow of the Royal Institute of British Architects (see Brodie 863-34). 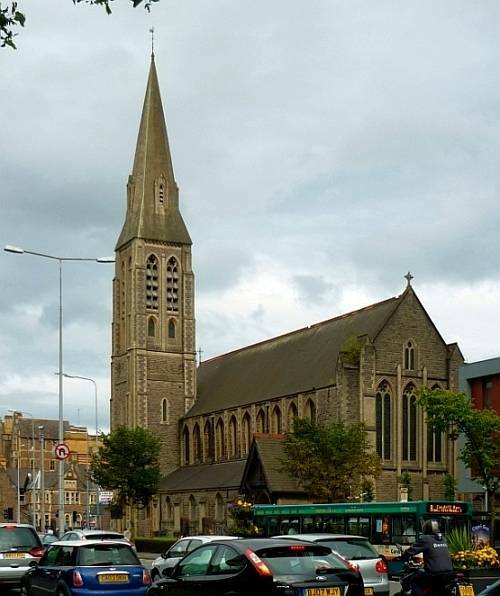 This Grade-II listed church was built as a "chapel" of St John, the city centre church, by public subscription, and is located at a busy crossing; diagonally opposite on the Edwin Seward's Cardiff Royal Infirmary. It is another Cardiff landmark, and is said to be Bruce Vaughan's masterpiece (see Newman 301). He has paid great attention to detail, both in the stonework and the stonecarving. 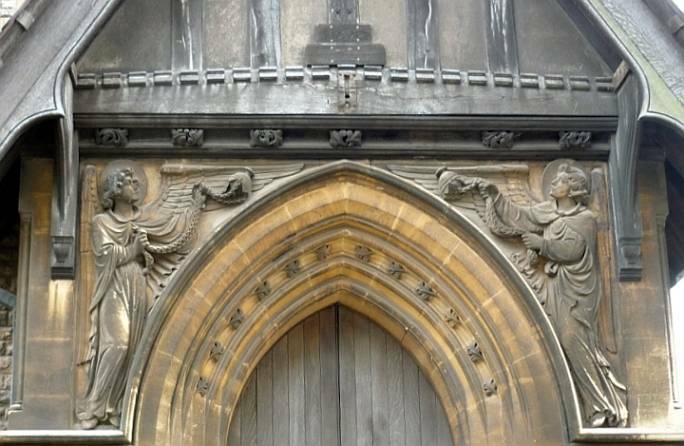 The appealing artistry here, for example in the depiction of two angels swinging censors over the porch entrance, would have owed something to his collaboration in these years with the Welsh designer William Brangwyn, father of the more famous Frank Brangwyn (see Horner 28). The interior was exquisite, with fine wood-carving, furnishings and stained glass. It is very sad that such a building should have become redundant, but good that as much as possible has been removed (see Kimber) and preserved. Matthew Howells tells us that "[m]ost items from the church are all around Wales": the font is in the entrance hall of Tredegarville Church in Wales Primary School next door, for example, and the beautiful reredos has been installed at a Grade II* listed church in Port Talbot — St Theodore's, designed by J. L. Pearson. Who got married in St James? 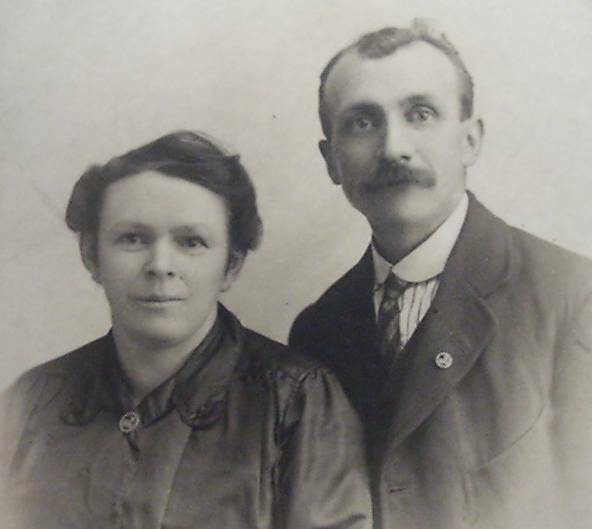 Ernest and Mary Ann Williams, in the earlier years of their marriage. Note that they are both wearing their Bible Student badges — this religious movement spread from America in the early 1880s onwards, and acquired a wide following in the South Wales valleys. Ernest Llewellyn Williams proposed to Mary Ann Bonnell towards the close of Queen Victoria's reign. 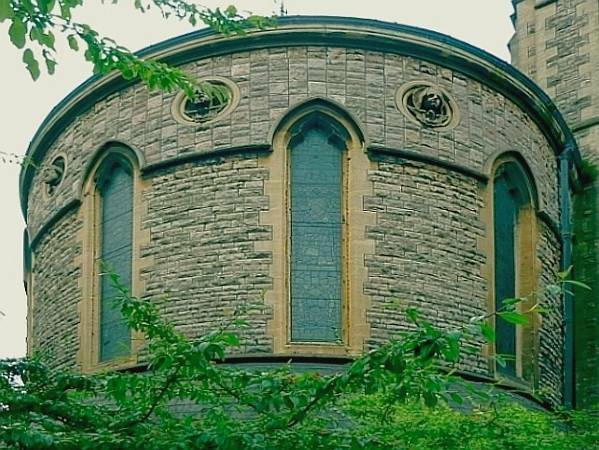 They both lived in what was then called Castle Road, Cardiff, and their marriage was duly solemnized at "The Chapel of St James in the Parish of St John Bapt., Cardiff in the County of Cardiff" on 31 January 1901. This was less than two weeks after the Queen's death, and shortly before her state funeral on 2 February. Ernest was twenty-two, and Mary Ann nineteen. It turned out to be a perfect match. They would go on to have a long and happy marriage, producing ten children, the last of whom died in 2012. They were the present author's maternal grandparents. Brodie, Antonia. Dictionary of British Architects 1834-1914. Vol. 2, L-Z. London: Continuum, 2001. Kimber, Keith. "St James Church — The Last Gasp." 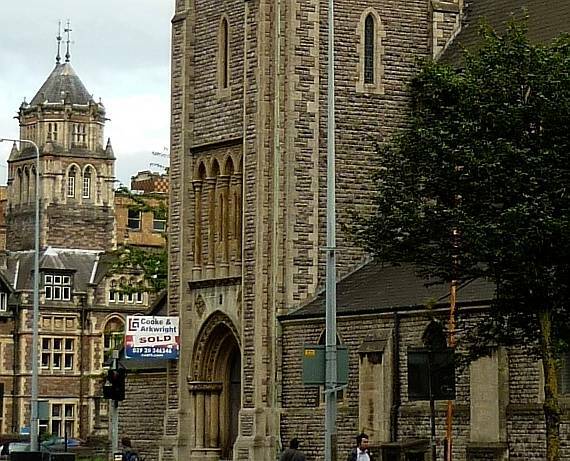 Edge of the Centre (Journal of a City Centre Pastor in Cardiff). Web. 13 April 2011. Lloyd, Thomas, Julian Orbach and Robert Scourfield. Carmarthenshire and Ceridigion. (The Buildings of Wales series). New Haven & London: Yale University Press, 2006. Newman, John. Glamorgan (The Buildings of Wales series). London: Penguin, 1995. "Town Improvements in Cardiff." Western Mail, 13 November 1885. 19th Century British Library Newspapers. Web. 13 April 2011.